Mininert push-button valves are highly dependable, leak-tight closures for screw-cap vials and other laboratory containers. When used with a glass vial, only PTFE and glass are in contact with the contents. Their unique features make Mininert valves the ideal closure for calibration standards, air- or moisture-sensitive fluids, derivatizing reagents, or volatile chemicals. Operation is extremely simple - push the green button to open the valve, insert the needle through the septum and take a sample, withdraw the needle, and push the red button to close the valve. 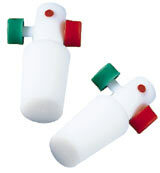 Screw-cap Mininert valves for vials are available in a variety of sizes. The crimp-top valve for 13 mm ID glassware slides into the neck of the vial and features a threaded flange which is turned to provide a leak-tight fit. Our Mininert threaded designs offer positive on/off fluid control as an in-line valve or syringe access as a termination valve at a sample point. 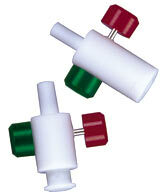 Convenient add-on syringe valves allow our C and D Series syringes to store samples at up to 250 psi. 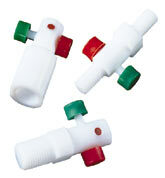 Models are also available to fit luer-tip syringes from any manufacturer. These silicone septa fit all Mininert valves. The installation tool is a handy device for quickly removing and a replacing needle seal septum.